Perhaps in part because the exhibit is a first attempt by the Smithsonian to display video games, it suffers from a problem of scope reflected in its title. Should the viewer of the “Art of Video Games” expect an exhibit centered on the graphical evolution of the medium? An exploration of the formal structures of video games as an art form? An argument for the artistic merit of games presented in the context of other media? A history of video games as an art form? The exhibit begs all these questions, and to some extent tries to answer them. Clear curatorial intention is missing, however, in part due to the crowd-sourced approach that I will address. After walking through the three distinct rooms that make up the exhibit, the visitor is left with an impression of the medium’s potential but without a clear understanding of video games as an art form. This introduction of games into the halls of a museum offers an opportunity to address the challenges of translating an interactive form to an exhibit, and to consider the interactions at the heart of visiting a museum in the first place. The challenge of representing interactivity appears at the start, as visitors enter past projected video from a series of video games. The first room is filled with artifacts from the history of games, including concept art and packaging, but the games themselves are nowhere to be seen. 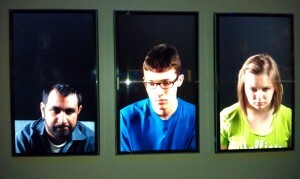 The text that accompanies each piece is limited, and this portion of the exhibit relies heavily on videos combining gameplay with interviews. In this first room is a set of videos of different changing faces, where each player is engaged with a game we cannot see. We can witness their intensity, their emotional responses, even their occasional shifting back and forth as they engage with their controls, but we only have a narrow window into their experience of the video game. These videos reveal what differentiates the video game from other media: the role of the player in shaping their own experience. It is precisely this interaction that the exhibit evokes, even though it only touches the surface of the medium. It is precisely their interactivity that provides video games the potential to become a superior storytelling medium. I say potential because video games are still in adolescence. The advantage that books, movies, and television have over video games is with time only. Like all other forms of media, hindsight will tease inspired works from the digital past, and these will serve as the cornerstones of great works yet to be created. 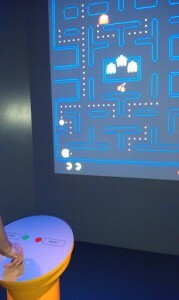 The centerpiece of the exhibit’s interactivity is found in the second room’s installations of five playable game segments: Pacman, Super Mario Brothers, The Secret of Monkey Island, Myst, and Flower. Each game runs on original hardware, but is divorced from the physicality of its system. A modern pillar holds the interface, and the image is projected on the wall. In some cases, as with the NES controller, the pillar interface retains the original control system. Others deviate, such as the giant trackballs standing in for computer mice on the point-and-click adventure games. These installations are successful at pulling visitors in, as the queues for Mario attest, and they certainly can be a powerful inducement for visitors-turned-players to revisit these and other games after they leave the museum. However, an exhibit needs to deliver beyond play, which is a challenge this compelling set of playable demonstrations doesn’t quite rise to meet. Consider, for instance, the difference between watching a film on its own, and watching it while hearing commentary by the writer or director. The creator’s comments offer a layer of embedded interpretation to the experience of encountering the text. An additional layer might be the critique of a film scholar. The missed opportunity in this exhibit is that the interaction with these games is not guided by any clear curatorial or interpretive framework; without it, the games could just as well be encountered at home. 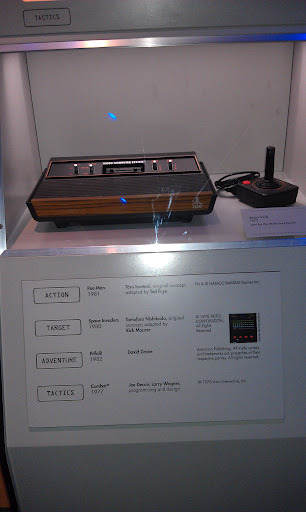 Likewise, the exhibit could have better highlighted the evolution of the form in each of these games. Drawing attention to important developments such as the incorporation of more advanced graphical accelerators and an accompanying increase in resolution and graphical fidelity, and the advancement of game interfaces to reflect increasingly complex interactions could have provided a more nuanced understanding of why these games are significant points in the evolution of the medium. Creating a clearer tension between the five games and the rest of the exhibit also would encourage visitors towards reflective play rather than nostalgic play – although the sight of avid gamers showing their friends or family the controls of Flower for the first time suggests there is value in the shared play. The five games offer a range of the types of interactions that games hold, as well as insights into the evolution of the graphics that are ultimately a central focus for the exhibit. Unfortunately, they are presented without sufficient context to explain the curatorial intention behind their inclusion. Once a visitor enters the third room, they are confronted with the history of video games as told through consoles behind glass. Ignoring the interface when considering games as an art form is impossible—take away the interface, and the interaction, and all you have left is video. Each system is thus accompanied by a highlights reel introducing the four games chosen by online voting. The incorporation of public voting provides another layer of interactivity to the exhibit but it also contributes to the lack of focus, making it difficult to follow any one theme through the three stages of the exhibit. But the crowdsourced voting and mainstream focus leaves only a few notable displays of indie games or experimental genres, such as Rez, flOw, Flower, and Okami. The rest of the list was pulled from voting, and is filled with mainstream commercial titles, including a number of series games (such as nearly every Zelda), which results in a strange incoherence and prevents a curated statement about the form. Perhaps the biggest danger of the popularity contest approach is that it allows some visitors to walk away with the impression that video games are exactly what they expected, with only a few moments of deviation from the same images they might have seen in ads or at their local Best Buy. One exhibit cannot possibly sum up an art form. The introduction of games into the museum space is tantalizing not only as an endorsement of the medium, but also as an exploration of ways to incorporate digital objects into the museum’s traditional exhibit structure. The risks of putting computer games into familiar frames rather than rethinking the frames themselves are high, as the consoles behind glass remind us. The “Art of Video Games” exhibit offers a glimpse of how games could be developed into an interactive curated experience, but greater intention in the presentation and choice of interactive elements is needed. As a first step, perhaps it will lead to further exhibitions that are less ambitious in scope but more intentional in their exploration of a particular facet of the medium’s artistry. Anastasia Salter is an assistant professor of Science, Information Arts and Technologies at the University of Baltimore. Her primary research is on digital narratives with a continuing focus on virtual worlds, gender and cyberspace, video games, educational games, and fan production. She holds a Doctorate in Communications Design from the University of Baltimore and a Master of Fine Arts in Children's Literature from Hollins University. She blogs for ProfHacker on technology and pedagogy, and writes a column speculating on the future of technology and pop culture for CinCity2000, Future Fragments. She's on Twitter as @AnaSalter.